My kitchen. Use of this image requires my permission. 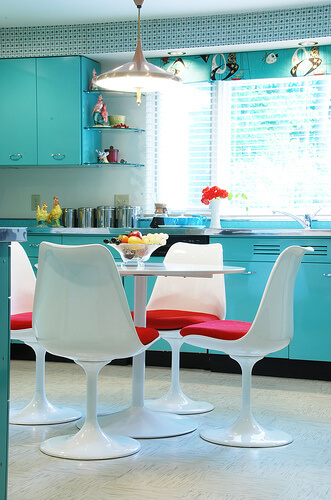 WHERE IS THE BEST PLACE to sell your vintage steel kitchen cabinets? As a follow up to my post on how much your metal cabinets may be worth, here is an outline of where and how you can sell them. Update: A reader analyzed selling prices in 2010, and we published her research here. WHERE IS THE BEST PLACE TO BUY vintage steel kitchen cabinets? Take these tips in reverse! The market for these cabinets is generally going to be very local. People will want to come look at them before they buy and to be sure, it will be a lot cheaper if they can pick them up rather than having to arrange for a moving company. But, “local” actually means “within driving distance” for someone who wants to buy a set of steel kitchen cabinets. So your marketing and outreach should really extend…3 or 4 hours in a circle around where you live, although I know of folks who have driven further to buy particular brand cabinets they need. 1. Craigslist is probably the most common source for cabinet listings when you take into account the entire U.S. — and it’s crafted to serve your local market, which is important when selling huge items like kitchen cabinets. I think they will only let you list in one city, and if that is their rule, you should abide by it. 2. eBay — I see lots of listing come up, and only one in 10 or seems to sell. However, there may be after-market bidding going on (at a lower price). eBay may work for you if you are in a larger market where there are more potential buyers. 3. 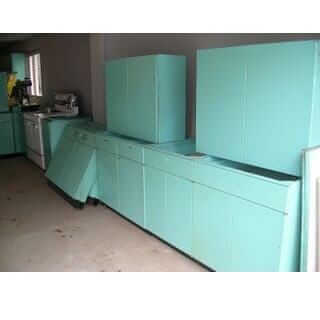 ReStore Habitat for Humanity and salvage places — I see vintage steel kitchen cabinets at my ReStore regularly. 4. Also — if you are a BUYER — ask your neighbors. They may have old cabinets in their basement or garage that were originally in the kitchen! Finally, if your cabinets are in really bad shape — with tons of rust, for example — take a look at the hardware. There is a market for vintage cabinet pulls — in particular old Youngstown handles. And, people with the old Genevas are always eager to connect with the white plastic concave piece behind the chrome pull. And, folks want the knife hinges that connect the doors to the base and wall cabinets. If you have parts, I’d recommend eBay — as they are not expensive to ship. 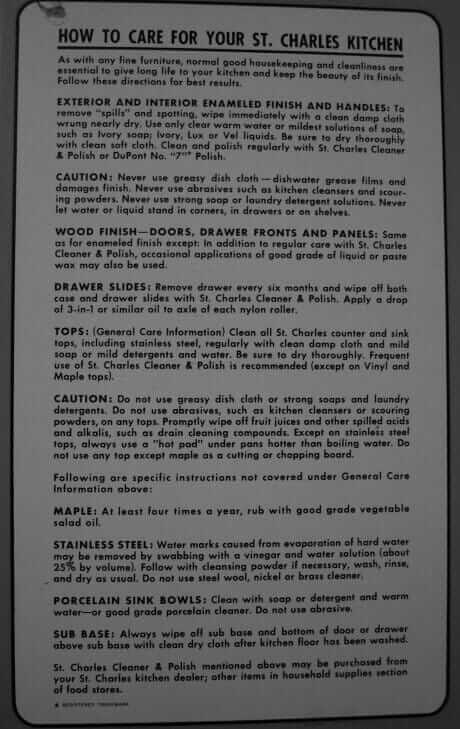 Click here to see all my stories about vintage steel kitchen cabinets — we’ve identified 80 brands! My kitchen is all Hotpoint. Tags on the inside are somewhat readable. My problem is, they have been painted to look like wood. From what I could actually strip off, it looks like they were originally white, but the paint and stain is very hard to come off the doors. I want them red in the worst way. Help!!!!! Can you please direct me to your forum where I can post my Youngstown cabinets for sale? I cannot find it based on other links I’ve seen posted. I just wanted to ask members a question about the Youngstown Lazy Susan cabinet. Not trying to buy or sell.